Dabhoi: West elevation of the Baroda Gateway. bl.uk > Online Gallery Home	> Online exhibitions	> Asia, Pacific and Africa Collections	> Dabhoi: West elevation of the Baroda Gateway. 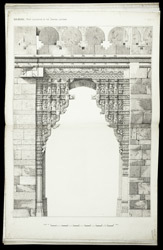 Illustration of the west elevation of the Baroda gate in Dabhoi from James Burgess' 'The Antiquities of the town of Dabhoi in Gujarat.' Dahboi, located 20 miles south-east of Baroda, is an ancient town with fortified walls which was built in the early 13th century by the Vaghela king of Patan. Key features of fortress include four 13th century gateways called the Baroda gate, Nandod gate, Hira gate, and the Moti Gate. The Baroda gate, located on the western side of Dabhoi, was originally constructed of hewn stone and reaches a height of 30 feet. The gate's walls are richly carved with decorative ornamentation and mythological figures including the incarnations of Vishnu with crocodiles and nymphs.